I am curious as to how many Māori poets we can name beyond a handful, beyond the much loved Hone Tuwhare. Open a New Zealand literary journal and do we still fall upon a Pākehā bias? 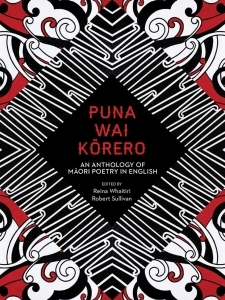 The arrival of Puna Wai Kōrero: An Anthology of Māori Poetry in English (2014) presents us with a selection of writing that celebrates a wide and vibrant field. The editors, Robert Sullivan and Reina Whaitiri have brought a glorious range of voices into the spotlight. Robert, of Ngāpuhi/Irish descent, is a poet and anthologist, and is currently Head of the Creative Writing Programme at Manukau Institute of Technology. Reina, of Māori/ Pākehā descent, is also a poet and an anthologist, and has taught English at the Universities of Auckland and Hawai’i. Along with Albert Wendt, Robert and Reina edited Whetu Moana (AUP, 2003) and Mauri Ola (AUP, 2010). Puna Wai Korero is a moving feast. The poets selected come from a variety of locations, circumstances, backgrounds, writing preferences. The choices of style, tone, subject matter and poetic techniques are eclectic. There is humour, inward reflection, love and loss. There are poems of the marae and poems of elsewhere. There are mothers, fathers, sons and daughters. There is politics on the quiet and politics loud and clear. There is grief. There is home. There are familiar voices, there are those that are not. There are writers known for their fiction. Through all this, I flipped a question that I carried with me through my doctoral thesis (does it make a difference if the pen is held by a woman?) to ask: Does it make a difference if the pen is held by a Māori. Do some writers deliberately and gloriously foster a Māori voice (perhaps, where the poet stands and writes from, how the poet stands and writes from, how the oratory traditions of the marae inflect the poetry, how genealogy inflects the poem and so on). I spent seven years hauling my question through politics, law, history, psychology, familial relations, art, literature, history, patriarchy within an Italian context and the Italian language. Over the past months, I have held a book that drew me in close to all of these things within the miniature frame of a poem and within the context of Aotearoa. You can view the poems within whatever cultural luggage you bring to them (a Western paradigm of how to write a poem and how to break a poem, both cemented by tradition and innovation). Or you can step out of that luggage and approach these poems afresh, and in doing so open out the ways in which we can make and read and hear poetry. This was the first joy of reading this anthology — navigating the burgeoning questions for which I felt inept at answering. The second joy, the equally sustaining joy, was the discovery of new writers along with a return to those well loved (whenever I visit secondary schools I share my James K Baxter/Hone Tuwhare anecdotes that kickstarted me on the path of poetry in 1972). A wee taste of what I have loved: a tingle in reading Hilary Baxter’s ‘Reminiscence,’ the heart and gap in all of Hinemoana Baker’s poems, the sharp kick of Arapera Hineira Blank’s ‘After watching father re-uniting with sons in prison,’ the utter joy of Bub Bridger’s ‘Wild daisies,’ the force of Ben Brown’s ‘I am the Māori Jesus,’ the insistent catch of Marewa Glover’s ‘Pounamu,’ the evocative laying of roots in Katerina Mataira’s ‘Restoring the ancestral home,’ the pocket narrative in Trixie Te Arama Menzies’s ‘Watercress,’ the piquant detail of Paula Morris’s ‘English grandmother,’ the subtle shifts in Kiri Piahana-Wng’s ‘Four paintings,’ the verve and aural steps of Vaughan Rapatahana’s ‘Aotearoa blues, baby’ (I want to hear him read this! ), the sumptuous detail in Reihana Robinson’s “God of ugly things,’ the poetic and political and personal stretch of Alice Te Punga Somerville’s ‘mad ave,’ all of JC Sturm (especially ‘At times I grieve for you’), Robert Sullivan (especially ‘Voice carried my family, their names and stories’), Apirana Taylor (especially ‘Te ihi’ and ‘Haka’) and Hone Tuwhare (especially, most utterly especially ‘Rain’). This is a book of returns, to be kept on every shelf. Bravissimo! This entry was posted in NZ poetry, NZ poetry book, NZ Poets and tagged Alice Te Punga Somerville, Auckland University Press, Hinemoana Baker, Hone Tuwhare, Kiri Piahana-Wong, Paula Morris, Reina Whaitiri, Robert Sullivan, Vaughan rapatahana on April 21, 2015 by Paula Green.